United by Glue: Petite, Whizzy Ninja-Bucket Action! We made it back to Sydney. I took both my laptops away with me (the two main ones) with every intention of doing something productive, but I basically played Scribblenauts Unlimited and Batman: Arkham City whenever anyone left me to my own devices. 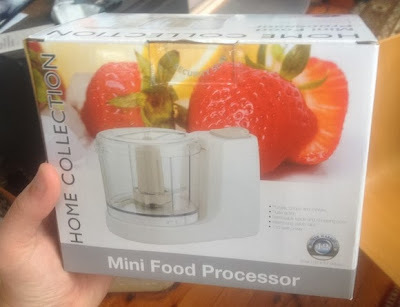 I got a miniature food processor in a Kris Kringle on Christmas Eve. I originally got a 1kg (100 piece) box of pralines, but I managed to trade for the buzz box. It seemed like an excellent trade. It still does. I think I live for this thing now. It strikes me as the the sort of thing that a bachelor would have, and I am one of those now. It even only does a very small amount, as if it is saying, "Your life is yours, and so is this single portion of goop." I was pretty keen to get down to my bachelory ways straight away, but I wasn't immediately sure how one proceeds with this sort of activity. I'd already decided on what I was having for breakfast, so my first step was to put that into my shiny new miniature buzz bucket. As far as bachelors go, we were feeling pretty bachelory. I want to take a moment to focus on the mininess of the 'mini food processor'. It's not very big. They didn't lie about that. The box does suggest that one might have some difficulty fitting strawberries inside it, but that is misleading. 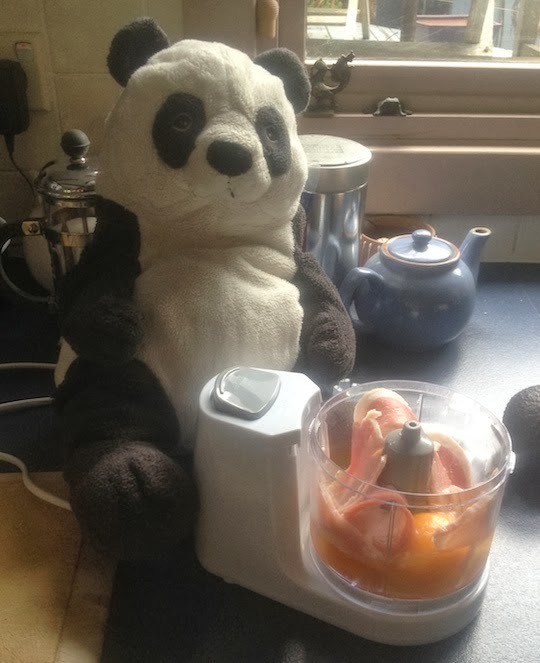 I've included a picture of it with Panda, who isn't the same size as most pandas appear to be on the internet. We haven't done a side by side, but he is pretty small. I think you get the idea anyway. He is new to this. We couldn't remember if he had ever been used for size comparisons before. We don't think so. That blue teapot is also abnormally small, so there really isn't much in this picture that is helpful. 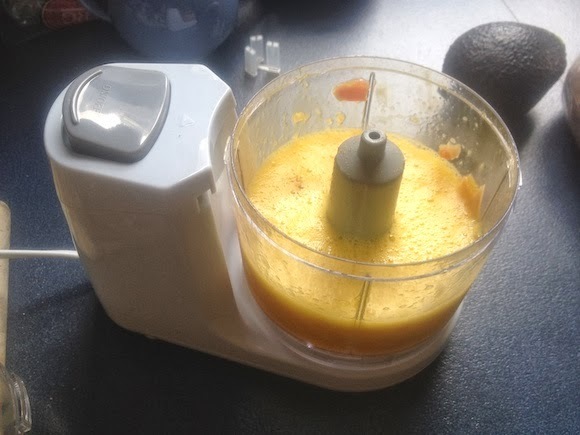 Once I had loaded my breakfast in, I pressed The Button. It only has one, which is good for us bachelors. It is also good because Panda's fingers don't separate. 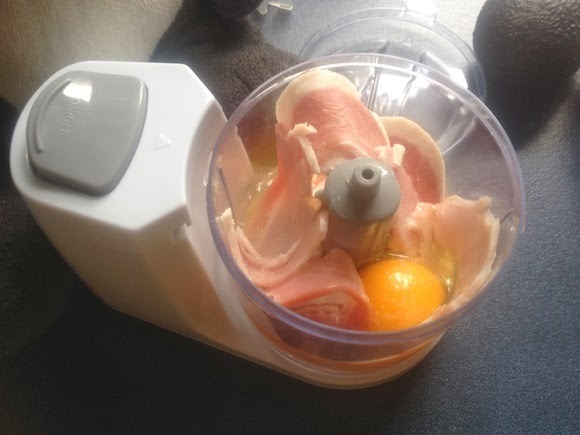 The result was a mechanically pre-chewed breakfast that looked a lot like freshly squeezed orange juice with bits of bacon in it, which might very well pass for breakfast in some places. Not at my places, or wherever I happen to be. I don't want that. If you're in a position to make me breakfast, keeping this in mind would be deeply appreciated. 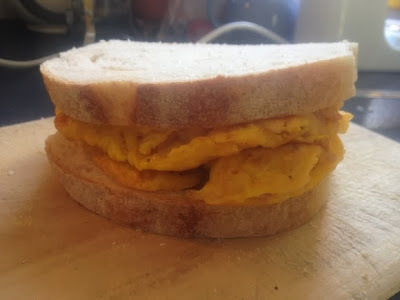 Mind you, if you're making me breakfast, I'm probably going eat what I'm given. 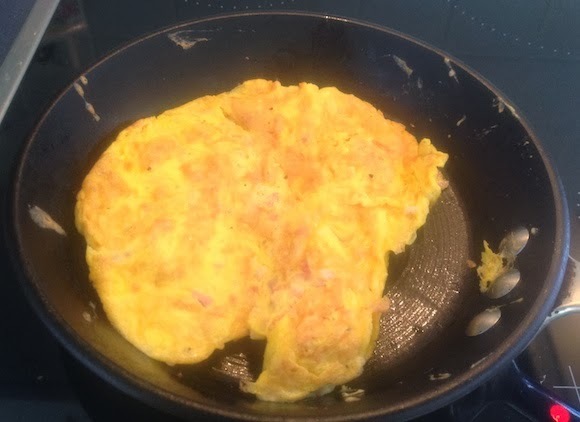 I fried it, which seemed like the only way forward at that point. I could've done one of a variety of other cookings, but there was already a pan out. I didn't really know what to do next, so I put it on a sandwich. This is the height of civility. This is the kind of thing that civilised people do. I'm not sure about the whole processing and frying your breakfast thing, which seems a lot less civilised. That seems like the kind of thing that lazy people do, or at the very least the kind of thing that people with brand new, petite, whizzy ninja-jars do. We're pretty happy with our first forays into this sort of activity. We like little machines that do things for you that you could conceivably do for yourself. We've been informed that this is the very same sentiment that will lead to the robot revolution.